The Camlink TP Professional Video Tripod is a 3 section tripod with tri-legs that help to remove "whip" at the start of panning. The friction damping fluid effect head features a quick release system, two control handles and a spirit level for accurate levelling via the tripods ball level head connection. 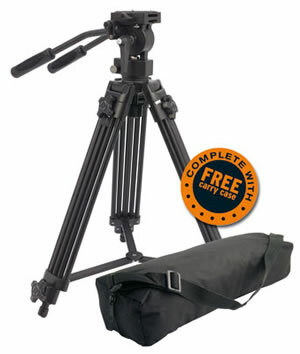 Leg braces help maintain stability and rubber feet keep the tripod secure, while the supplied carry case ensures the Camlink TP Professional Video Tripod can be conveniently transported anywhere. This tripod is perfect for cameras, scopes and digiscoping! !